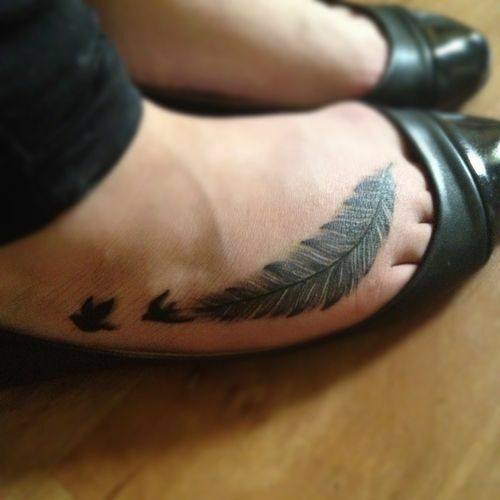 “Birds of a feather flock together.” That particular saying appears to have inspired a number of feather tattoos for girls, including the large feather and birds tattoo this girl has inked on her foot. 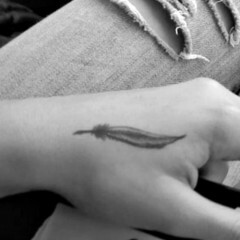 The feather tattoo is inked in black and white, and features a large feather extending from her toes along the side of her right foot, and two small birds flying away from the feather. 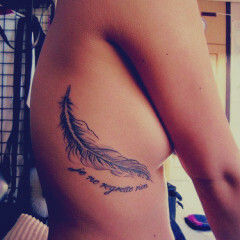 It is common to see feather tattoos inked in combination with bird tattoos, as the two tattoo designs somtimes have similar meanings. Because feathers are often associated with the spiritual world, many feather tattoos symbolize the soul or are a tribute to a loved one lost. 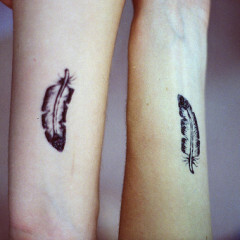 In this case, the black and white feather could represent freedom – as in “free as a bird” – or a special relationship between two people – represented by the two birds.